Having people over to your house is one of the warmest, most generous gifts you can give your friends and loved ones. If your guests are coming, they’re already primed to have a good time—all you have to do is keep them in the mood. Whether you’re having a person over for a candlelit dinner or a big get together, you’ll probably need a few supplies before, during and after your gathering. Especially if you're a new home owner, you'll want to invest in some of the following necessities. 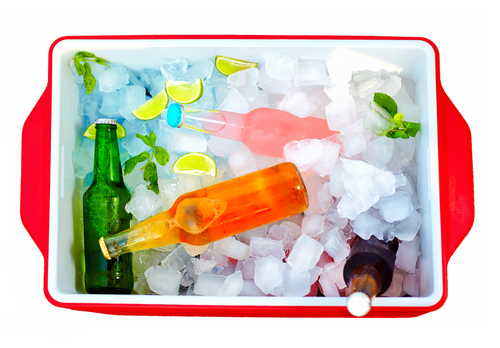 Coolers may seem more appropriate for summer parties, but don’t overlook them during the holidays. If you’re brining your turkey overnight, for example, you may not have enough room in your fridge for all of the food you’re prepping and a bucket big enough to soak the bird. At a more casual function, the cooler can serve as storage for beer and white wine. If you're in the market, our pick is the Coleman Xtreme 70-quart cooler. It’s affordable and is known for its long ice retention, which will help ensure that your brining turkey stays cold. Fire pits are good for big and small parties. They add mood lighting, atmosphere and a spot to gather around. Kids can toast marshmallows over them, and it's a great place to share campfire stories. There are a wide variety of fire pits available, all with different vibes (one even looks like a flaming Earth). For a more universal aesthetic, our pick is The Landmann City Lights Memphis ($123). It has a look that will appeal to just about everyone. It’s durable, holds a good amount of wood, is easy to assemble. It won’t be loud enough to disturb the neighbors, but we recommend the $250 Sony BTX-500 as a modest home bluetooth speaker for a get-together of 2-12 people. It’s the best pick under $300 and has a six-hour battery—probably enough to last the duration of your party, depending on how long your affair lasts. One of the worst problems to have at a dinner party is insufficient seating for your guests. That’s where folding chairs come in handy. We recommend the Mity Lite Flex One folding chair ($100 for 4 on Amazon or $20 each on Sam’s Club), a durable, ventilated seat made of steel and flexible polypropylene that molds to the sitter’s shape and can purportedly hold more than 1,000 lbs. It’s 1.5” wider than your standard folding chair, can be stuffed into a closet and is comfortable enough that your seated guests won’t feel like second-class party attendees. From ambiance to food, it's important that you help make your party guests feel like home! What party hosting gear did we miss? Let us know in the comments below!